Come play in Nature at Aspen's Hideaway. 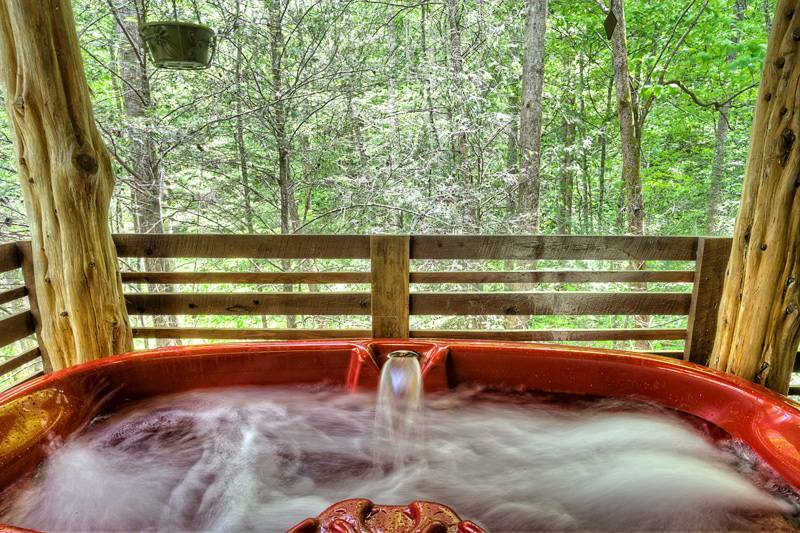 With absolute privacy, enjoy relaxing in the hot tub while taking in the peace and serenity of the surrounding woods. As you open the door and prepare yourself for the beauty of the cabin, Aspen herself welcomes you. Upon entering the cabin, take a moment to look at the beautiful woodwork of the columns and on the doors. With everything you need in the full kitchen, you can choose to spend the day at the cabin cooking your favorite meal. Find a great movie to watch on the flat-screen TV while taking it easy on the leather sofa or in the recliner. Or, if you like listening to the sound of water, go into the Four Seasons Room and lay around on the chaise lounge and turn on the waterfall. Like to write stories or keep a journal then take advantage of the writer's desk. Out of the french doors, you will find the charcoal grill with all of the grill utensils right at hand. The sauna is a great place to melt your worries away but for that romantic side, the Spa Berry Hot Tub is the place for you. At bed time head upstairs to the king size Aspen bed. Not quite ready to go to sleep yet, you can find something to watch on the flat-screen TV or pop a movie into the DVD player. For those who enjoy exercise, there is a Pro Form Recumbent Bicycle. The master bathroom holds a wonderful duel head rock shower as well as a Kohler Happy Birthday Claw Foot Tub. 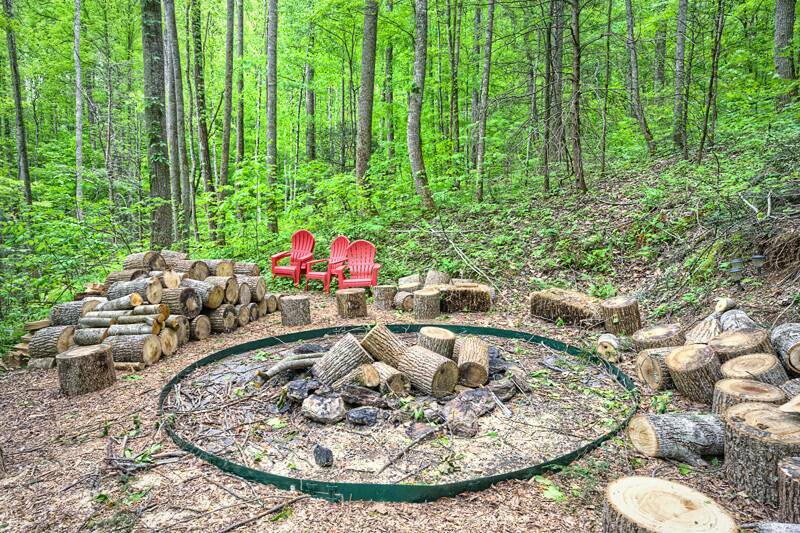 Some extras at the cabin is a large outdoor fire pit with seating, camera system on the property, Herb Garden, rail lighting on the deck, outdoor rocking chairs, wine cooler and log table with seating. Don't forget you can bring your family dog with you to run around in the fenced in pet kennel run that has sun and shade spots. With Aspen's Hideaway being on 7 acres of heavy woods, you can bet this cabin is the perfect romantic getaway for you and your loved one to come to the mountains and get away from it all. This cabin offers local channels. *Large pets are accepted at Aspens Hideaway! WIFI is not available at Aspen's Hideaway due to being located deeply back on 7 acres of wooded land. Aspen's Hideaway is decorated for Christmas! Aspen's Hideaway is the perfect anniversary getaway! This cabin did not disappoint! We loved bringing our fur baby with us, and every thing you could need for a dog was pretty much provided! It was peaceful, we loved being able to listen to the rain on the tin roof. There are so many intricate details throughout the cabin, from the woodwork to the deer hoof towel rack! We had an amazing week and were definitely sad to leave! We came for our Honeymoon from FL. The cabin was exactly as advertised & the staff at Heartland were welcoming & polite. The cabin was clean & beautifully decorated. Our specific cabin allowed dogs, and though we would’ve loved to bring ours, you cannot tell that dogs reside from time to time- the cleanliness is amazing! We will be back! Thank you! This place was beyond my expectations. The pictures do not give this place any justice on how it actually looks. It was so comfy and made me feel at home. It was relaxing. The hot tub was amazing, especially with the cold weather. I enjoyed the backyard for my dogs to play in. The set up was beautiful there! I will definitely return! Perfect wedding moon cabin! We totally enjoyed our stay. Our fur babies loved it too. The decor was perfect. So much detail was put into this cabin. Would definitely return to Aspen Hidaway! 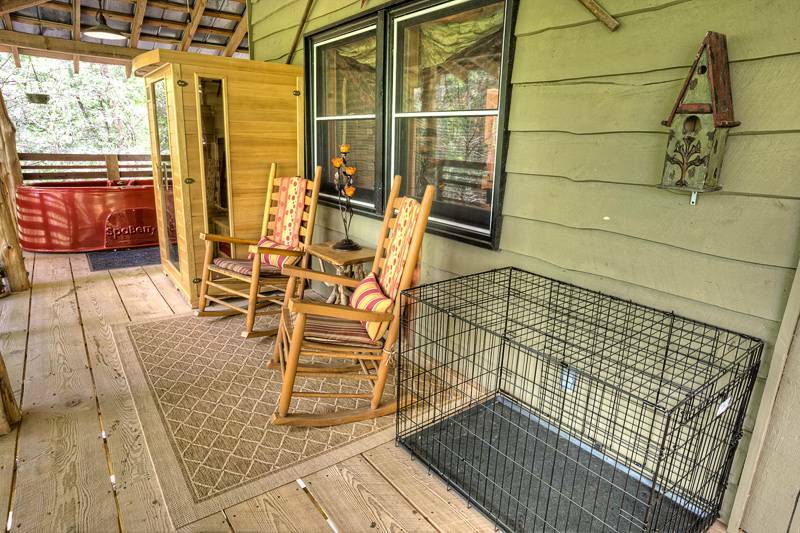 The cabin was an amazing romantic getaway & was perfectly suited to bringing a dog. The fenced area to let him out was a pleasant surprise. We also feel the cabin was different from others we’ve stayed at because it had a clean adult feel without going to far “grandmas house” as other cabins do. The one thing I needed and didn’t find were cleaning supplies like a mop for any accidents. We enjoyed the piece and quite. Very secluded. Just the right size cabin for my wife and I. Wish we could of stayed longer. 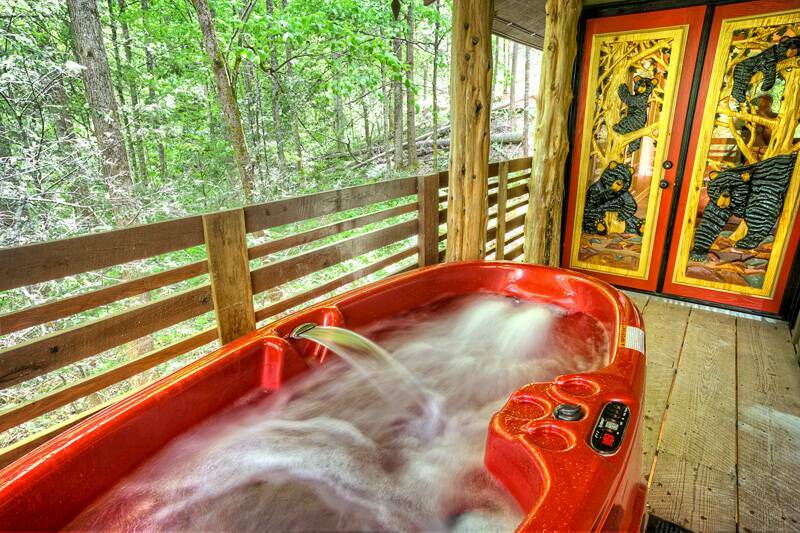 Aspen Hideaway made our stay in Gatlinburg the perfect getaway! This cabin was amazing! It was quiet and private, but still close to town. The decor and craftsmanship made it even more enjoyable. The pet friendly aspect was a plus for us seeing as we always travel with our two small fur-babies. 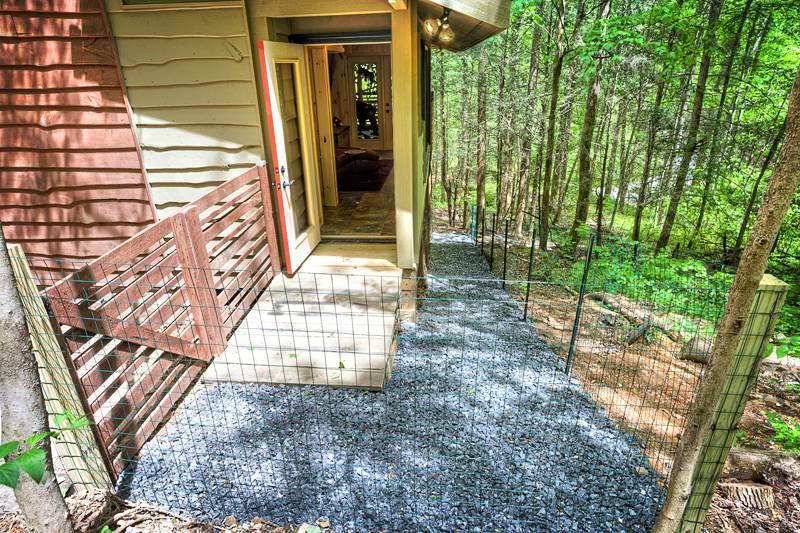 There was a fenced in area for the dogs to run and a kennel on the deck. We couldnt have chosen a better place to stay and plan to stay here in the future! Heartland cabin rental employees were very friendly (even down to the cleaning lady we met on our way out) and made sure everything went right with our stay! Highly recommended! What a great place to hang out. Beautiful property. Easy to get to, check and and out easy, and customer service was great. Beautiful and relaxing cabin. Well equipped and very private. The Cabin is beautiful, very relaxing and peaceful and very private. Well equipped with anything you might need or want. Did not have the dogs with us but almost wish we had as there was everything that we would have needed for them. The first morning I got up and fixed a cup of coffee and sat in the chaise lounge in the back room with all the windows and enjoyed watching the deer licking there little salt block. So Beautiful and SO close to us!!! Very warm and very inviting cabin. Felt wonderful to come home and relax in such a private and beautiful place!!! Another wonderful experience with Heartland rentals! You guys are the best! My only down was that the owners of the cabin changed the gift from lotion and soap to Pancake mix. Perfect, romantic get-away! The staff at Heartland was very nice and helpful in every way, through the chat line and in person. The attention to detail at Aspen's Hideaway is awesome, couldn't have ask for more! We had a wonderful, peaceful stay and hope to stay here again. It was a perfect area for walking our dog every morning and afternoon. The road was quiet and safe to venture out with Angus, our English Labrador, on his leash. Let's not forget how clean the cabin was, it was spotless! Ya'll have an awesome cleaning service! We just loved it here! Thanks so much for a great experience! We rented Aspen's Hideaway for our 10 year anniversary. We have stayed at several cabins in the Smokies, but this one was by far the best. As the other reviews indicate, the attention to detail was amazing. Great location, and could not ask for anything better. For the tech savy folks, I know they have to tell you that the cell/internet is spotty, but if you have ATT or Verizon, we had 4-5 bars at the cabin. Plenty enough to stream HD movies, etc. We brought our english bulldog and he had an amazing time. Would definitely recommend this cabin, and we will rent it again. Everything on this trip was outstanding. It started with our first contact with the office staff from Heartland Rentals, through booking the cabin, payment and the customer service of the staff when we realized that something was left at the cabin after we checked out. The staff helped us to make arrangements to have that shipped directly to us. 10/10 for the staff. Thank you Misty. The only thing that could have been better, as mentioned above was the duration of our stay but that is our fault, nothing against the cabin or Heartland, that was 100% our fault. 9/10 for our bad planning. I recommend at least 4 days for your stay. We had 2, it was no where near enough time to even begin to experience everything. The cabin was wonderful. Would have liked to have more comfortable chairs to relax in on the porch. The privacy was excellent, we enjoyed our stay. Completely satisfied with our stay other than would have liked to have been provided with more linens. 5 star in every respect, with detail thought out in your every need., would stay again!!!!!! We had an unbelievable time and made some amazing memories! Great cabin with all the amenities. We had a wonderful time in Gatlinburg and it wouldn't have been the same had we not stayed in this beautiful cabin. We love Aspen's Hideaway! This was our second time staying there. It is private and quiet. The cabin is very cozy and clean. We always have a very relaxing stay. Thank you Heartland Rentals! Great cabin, perfect location, decor was awesome. Would definitely recommend this place and would definitely stay here again. Beautifully decorated cabin in a secluded location. We enjoyed all of the attention to detail, from doggie bowls and cookies for our pet to toiletries in the bath. The location is good, but we had a hard time getting delivery of food, so some current delivery option lists would be wonderful. We loved that the cabin allowed for my dog to stay without size or breed restrictions! The price of the cabin was comparable to others in the area.The rental company was wonderful to deal with, and we will surely rent from them again! Came up for 38th anniversary and enjoyed the peace and quiet. Beautiful and secluded yet convenient cabin blew us away! We come to Gatlinburg relatively often, and have stayed at a lot of different cabins. If you're looking for an amazing experience at a reasonable price, this place is it. It was great for our dog Grady as well. Having the dog run with the enclosed space below for a dog to root and do their thing is an excellent idea and our pup definitely had some time down there. She got to bark at some deer as well. The cabin had interesting decor that was appropriate, but not overbearing and cheesy like in some cabins. Being completely surrounded by the forest was an excellent feeling, and the thunderstorms that hit on Friday added another layer to our relaxation with the tin roof over the patio. 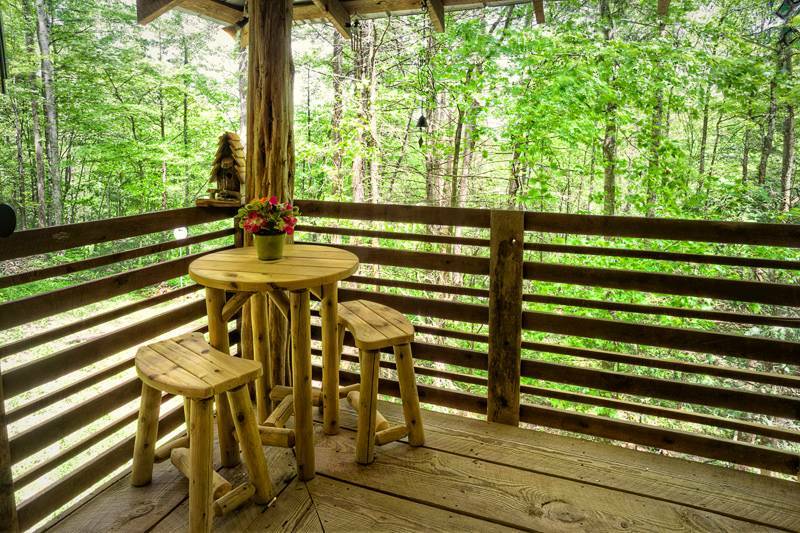 The cabin, while secluded is reasonably close to a Food City, and is a very short drive to the main strip of Gatlinburg. The kitchen is well equipped, and the windows that open out are beautiful and very functional. One recommendation to the owners would be to get internet/wifi. Although, Id imagine the location has made it difficult, otherwise it probably would have already been done. And if internet ever does get put into place, upgrading to BluRay players that have Netflix/Hulu etc. My wife and I needed a quiet week end away without the kids and this cabin was perfect. The cabin was private and had everything we needed to make it a perfect weekend away. The cabin was clean, well stocked and comfortable. The fire pit was great and we enjoyed much time in the hot tub. We have stayed at several cabins in the area and this is by far our favorite. What made it even better was being able to bring our beloved boxer with us. We have been married for 20 years and get away once a year to rest and recharge. This was one of the finest cabins we have stayed in. The attention to detail and warmth was wonderful. I give it my highest recommendation and the staff at Heartland was wonderful. Cabin was clean and well furnished and the fenced in area was great for our boston terrier "Butch"!!. Communication from the staff at Heartland Rentals was superb. We stayed here for 4 days with our 2 dogs and it was such a wonderful time. The cabin was tucked in the woods and was very secluded. 15-20 minutes away from restaurants and other points of interest, not bad at all. The dog run was a must-have with our 2 dogs - we were glad to have a spot where they could run off-leash. The next time we come to the area and bring our dogs, this is where we will stay again! We had to choose a different cabin this visit as our reg one was booked... the girls were great as always helping me find one that we could take Tucker (our fur baby) too. When the fires happened and we called to ck on our fav cabin and our Christmas rental and the girls... we were glad to hear both cabins were ok and ppl were good. We had had a very bad exp with a previous cabin rental company, and that's why we will not rent from anyone else except HEARTLANT RENTALS !!! The decorations for Christmas made it special since we go to the mountains for Christmas!!! This cabin was perfect !!!! Over the past 15 years we have had great stays in Heartland cabins. Their staff are always helpful and accommodating; cabins are nicely maintained. This is our second time at Aspen's Hideaway and we love it! We love being able to bring our dogs and really appreciate the fenced in yard for them to play and potty. 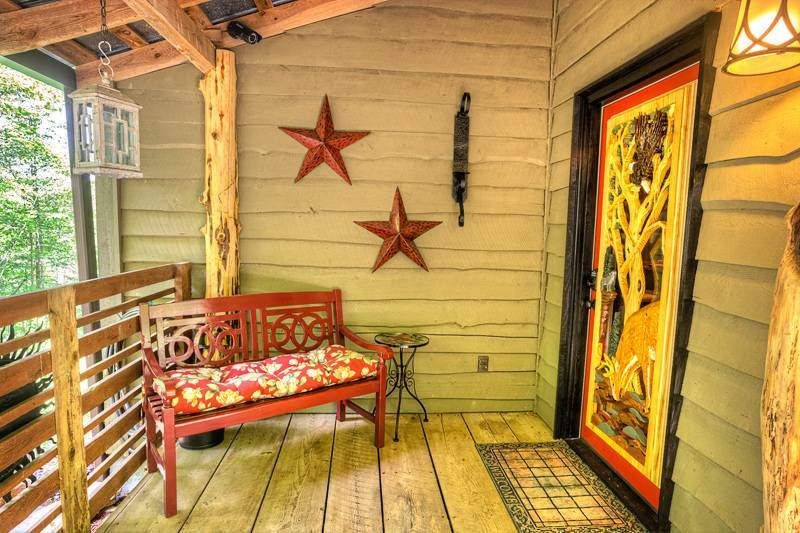 The cabin is private and quiet with beautiful woods and mountain views. 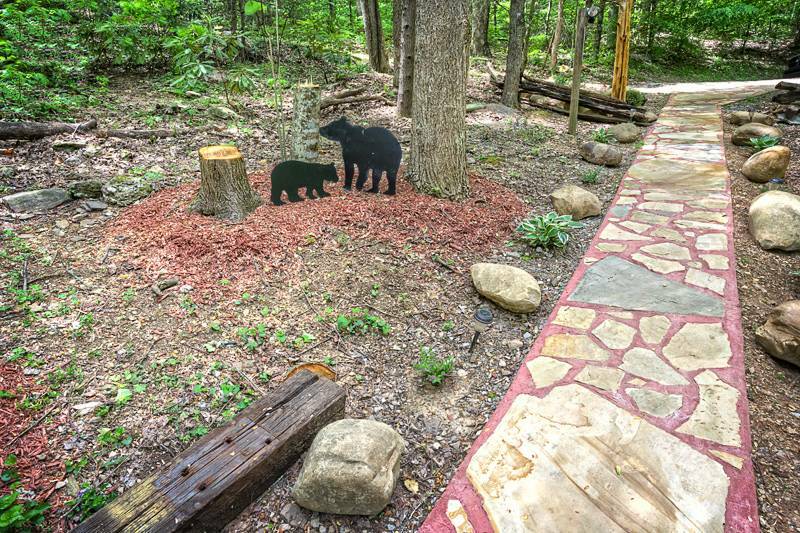 The cabin is off the beaten path near the Arts and Crafts Community but it is also close enough to the Park, Pigeon Forge, downtown Gatlinburg and even Sevierville to get to restaurants and attractions easily. Best cabin we have stayed in. Our stay at Aspen's Hideaway through Heartland Rentals was absolutely the best experience ever!! We had an amazing time in an adorable cabin! Beautiful cabin; beautiful views. Check in was easy; cabin was very clean. Already planning next year's trip to this cabin! The cabin was excellent! The only thing was the hot tub was not heating. Had to call and someone came out to look and it. Took until the next morning for us to us the hot tub. We had the best time on our honeymoon here! 100% recommend this place to any couple that wants a peaceful and romantic getaway! We will be coming back! We stayed from May 1-8. All I can say is "Heaven". So very nice, very clean and tasteful decorated as well. Thank you for sharing Aspens Hideaway. The cleaning staff does a spectacular job!!! KUDOS. .. We will be back. The cabin was beautifully decorated and the seclusion was great. Not far out of town but privately tucked in the mountain. My dogs loved it too. So peaceful.. Came during the off season so we got to spend a little extra time at the cabin. The best vacation by far, I've ever had. We absolutely LOVED Aspen's Hideaway! Our dogs loved it too! It was so nice not only to be able to have our dogs with us but to have a safe fenced in area where we could let them out. We have stayed in many other cabins in Gatlinburg and Pigeon Forge but this was by far the best cabin we have stayed at. It was perfect for us - VERY secluded and QUIET and away from the crowded areas of Pigeon Forge and Gatlinburg, but still close enough to get to all the attractions, shopping and restaurants easily. We loved being so close to the Arts and Crafts Community too. All the details at Aspen's Hideaway were fantastic as well from the furnishings and decor to the huge, covered wrap-around back porch with hot tub, sauna and rocking chairs for relaxing. The dog crated was another nice amenity we very much appreciated since we have one dog that likes sleeping in a crate. We will definitely be returning to Aspen's Hideaway for our yearly vacation to Gatlinburg! Totally the best honeymoon spot. I Loved this cabin, Heartland was awesome to deal with I am definetely planning on renting one again. Thank you so much. 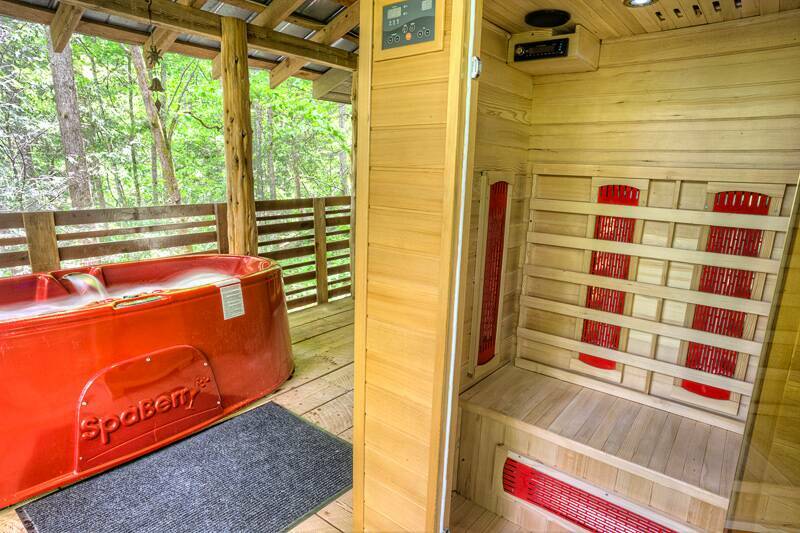 Very secluded, peaceful cabin with all the amenities you need to have a great stay. The staff was very helpful and friendly and answered all my questions with no hesitation. The cabin I can't say enough about aspens hideaway the owner of this property should feel blessed to have such a beautiful home. My husband and I are country people and he is a avid hunter so this place was perfect. We r also building a home next year and got several ideas from this cabin. I have already recommended this cabin and will planning another stay there. We enjoyed our stay tremendously, we loved the privacy! Beautiful cabin with complete privacy! Easy check in and out. it was great,cant wait until next year. the cabin lived up to the expectations i had from looking at it on line. Accommodations top notch.....we will return. Owners attention to detail did not go un-noticed. Our dog loved it as did we. My husband had to drag me out kicking and screaming-I did not want to leave! The cabin itself is beautiful. The decor' was perfect-rustic with all the charm of the mountains. We felt at home here. Everything we needed was at our fingertips. The cabin was clean and secluded, which we loved. The hot tub did the trick for the late evening relaxation time! I would welcome another weekend at such a marvelous place! !